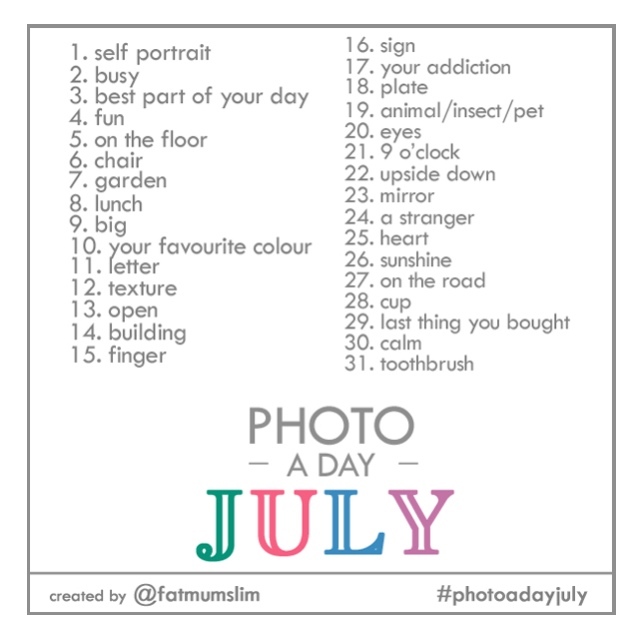 The list for July’s Photo-a-Day is up for anyone who wants to play along for the month. I’m going to try to keep it up. July 11-15 will be done from San Diego Comic Con. Thanks as always to Fat Mum Slim for creating this challenge. The hashtag for this month will be #PhotoadayJULY. This entry was posted in Instagr.am, Photo-a-Day Challenge and tagged Fat Mum Slim, FatMumSlim, instagr.am, July Photo-a-day, Photo-a-day, photo-a-day challenge, Photoaday, PhotoadayJuly, Pictures. Bookmark the permalink.